SORAA, the world leader in GaN on GaN™ LED technology, announced today that the company will launch and display large lamp versions of its innovative SNAP System™ along with new accessories at LIGHTFAIR International (June 3 - 5). Last year, Soraa’s award-winning MR16 SNAP System™ transformed lighting design by allowing users to customize light directly on the lamp rather than on the fixture. With the addition of PAR30, PAR38 and AR111 LED lamps to the SNAP System™ line, customers now have a choice of lamps as well as accessories to perfectly tailor light in restaurant, retail, hospitality, museum, and residential applications. Due to its bright, point source GaN on GaN™ LED and breakthrough prismatic optic, Soraa’s LED lamps can accept a magnet in the center of the lens, enabling a simple accessory attachment mechanism without major impact on light output or efficiency. The innovative, easy-to-use magnetic accessories allow customers to adjust the color, shape and soon direction of the light beam. 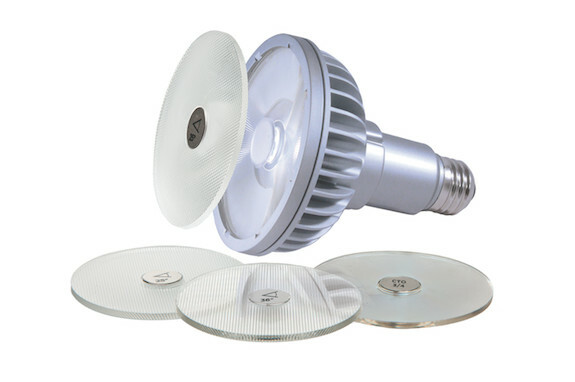 All of Soraa’s SNAP System™ LED lamps have the company’s signature elements of full-visible-spectrum light; point source optics for beautiful, uniform beams of high intensity; and Violet-emission 3-Phosphor (VP₃) Vivid Color, and VP₃ Natural White which reveal the magic of whiteness and colors in every environment. Soraa’s SNAP System™ has won a string of high-profile awards, the most recent being the prestigious 2014 Red Dot Product Design Award. For more information on Soraa’s SNAP System™ and GaN on GaN™ LED lamps, visit www.soraa.com, or see them for yourself at LIGHTFAIR International, Booth 7718, Las Vegas, NV (June 3 - 5).